Looking for a short, easy, serene getaway in the high country that offers outstanding long distance views of the Blue Ridge Mountains? This is the trail for you. 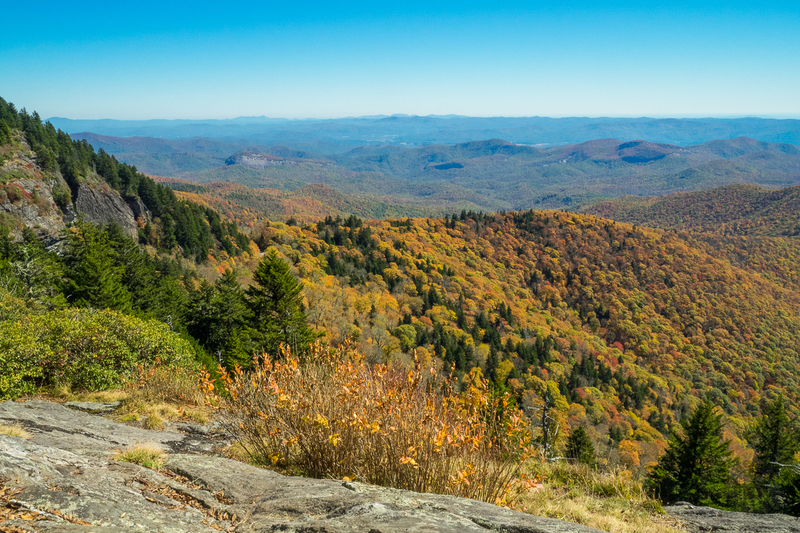 This little stretch of the famous Mountains to Sea Trail will take you from Black Balsam Road, through a dark and deep balsam spruce forest, across Silvermine Bald and on to Chestnut Bald to a splendid overlook of Looking Glass Rock, Pilot Mountain, and Pisgah National Forest’s Cradle of Forestry. If you have your binoculars or a zoom lens, you can see all the way to Lake Jocassee in South Carolina, and to the Black Mountains northeast of Asheville. This is one of my go to trails when I just want to sit and meditate for awhile. Thisvisit was on Wednesday, October 21, 2015 from 12:00 noon to 2:30PM. My plan was to take the MST to Chestnut Bald, then return. Hike Rating: Easy. Some route finding required, but mostly this is a nice easy stroll. Be careful on the rocky overlooks. It is a long way down. Trail Condition: Good. There are roots to beware of, but this is a well-worn path. Starting Point: Mountains to Sea trailhead across from Black Balsam Knob. Trail Traffic: The parking area along Black Balsam Road was full, but I only encountered one other pair of hikers on my side of the trail. Apparently everyone else was over on Black Balsam Knob. I made a good choice. Just to make sure you know where this is, when you drive up Black Balsam Road from the Blue Ridge Parkway the trailhead is on the left. Most hiking in this area occurs on the right side of the road, but this one goes toward the south. The trails starts out through a very dark black balsam spruce forest, one that would be easy to walk in circles if not for the white blaze marks on the trees. So be sure to look for the markings or you could become disoriented quite fast. After a quarter mile you’ll pop out into a clearing with a view of the majestic Black Balsam Knob behind you. There are occasional primitive campsites sprinkled about, made apparent by the unsightly fire rings. The giant trees change to bushes for a few hundred yards, mostly blueberry. It’s fun to watch these shrubs evolve through the seasons, starting as bright green in spring, developing their fruit in late summer, changing to a fire engine red in autumn, then losing their leaves completely in October. That is the stage I found them in on this recent trip. You will then enter another spruce forest as the trail moves over to hug the rim of the cliffs high above the Blue Ridge Parkway. You will no doubt hear the traffic far below you, especially those dang noisy Harley Davidsons that are so common on the Parkway. We try to keep pollution away from our eyes and noses. It would be nice to reduce the ear pollution as well. Watch for the occasional short side trail on the left that will take you to small overlooks of Pisgah National Forest stretched out in front of you to the south and east. But you ain’t seen nothin’ yet. For example, this view of Looking Glass Rock is from one of the spur trails on Silvermine Bald. If you’re here in Spring, among the wildflowers to look for along the trail are multi-colored trillium as well as pink shell azalea. You’re also likely to find plenty of moss and lichens during all seasons, including the unusual reindeer lichen that normally grows in Canada, but was deposited here in the Blue Ridge and Smokies high country during one of the Ice Ages. Just about a mile into your hike you will come to the junction with the Art Loeb Trail along the rim of Silvermine Bald. It is climbing up from the Blue Ridge Parkway far below. Turn right here to stay on the Mountains to Sea Trail. Soon after the trail makes a hundred foot descent into a gap and a small meadow. Folks use this meadow as another primitive campsite. In summer you are likely to find turk’s cap lilies growing here. On the far side of the meadow you will climb back up the hundred feet you dropped before. Keep your eyes peeled on the left for the very large rock outcrop that denotes your arrival at Chestnut Bald overlook, the destination for this trail report. 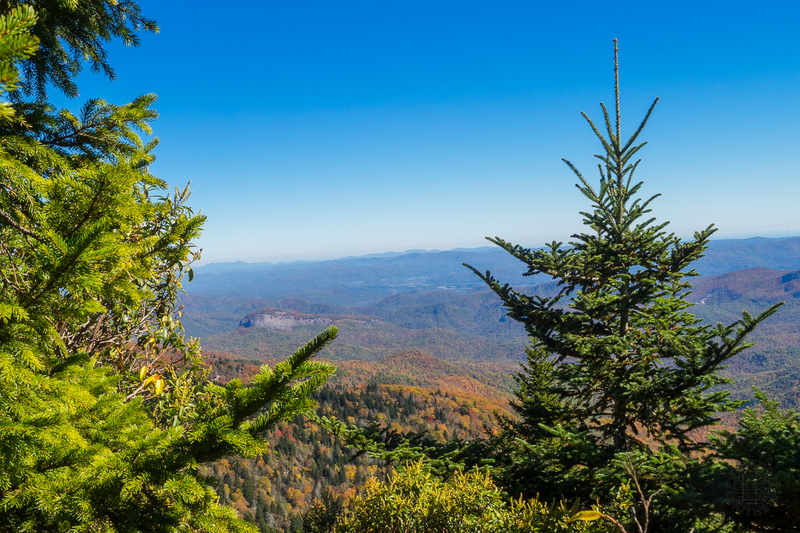 Unlike the other bald mountaintops that are so common in Western North Carolina like Roan Mountain, Max Patch, and even Black Balsam, Silvermine Bald and Chestnut Bald really no longer are. Bald, that is. But they do have these wonderful natural overlooks that I think are among the most picturesque viewpoints in all of Pisgah National Forest. From this outcrop on Chestnut Bald you can see the cliffs plunging below Silvermine Bald to your left, with the north and west faces of Looking Glass Rock jutting up from the valley below. Directly in front of you is the long spine of Shuck Ridge leading to the pointed top summit of Pilot Mountain. If you squint your eyes, on a clear day you can see Lake Jocassee 40 miles away in South Carolina. You can’t see it because of trees, but directly to your right is the massive stone face of Devils Courthouse. I almost always enjoy a meal here, and totally relax. The beauty of the scenery calms and soothes me. When I simply want to get away for a few hours from the hustle and bustle of everyday life, I like to come here. This is the view to the east from Chestnut Bald overlook. I think it’s one of the best around. I have been sitting at this spot when the entire panorama was engulfed in fog. I could still envision what I knew to be there. So strong is my remembrance of the beauty of the scene that I can picture it with my mind’s eye. I have been here every season except winter. The Blue Ridge Parkway here in the high country is closed in winter. But there is a means to access this spot with a longish hike from Hwy 215. Perhaps this coming winter I will treat myself. If you continue straight ahead on the Mountains to Sea Trail beyond Chestnut Bald, it eventually does spill out onto Hwy 215, then resumes on the other side of the road into the Middle Prong Wilderness. But on this day I was content to enjoy the serenity offered by my seat on the eons-old granite of my favorite outcrop, then turn around. On the way back, the sun angle had changed so I took some more pictures, and took my time. I did encounter a young couple with backpacks who were no doubt planning an overnight in the wilderness. Their black lab seemed very excited by the opportunity. I can’t blame him. But these were the only other folks I saw all day. That is until I got into the mess of leaf peepers on the Parkway. To summarize, this is a very nice hike that isn’t at all difficult, but will enable you to see some of the best views that Pisgah National Forest and the Blue Ridge Parkway have to offer. You might want to leave the toddlers at home for this one because there is some exposure to cliff edges. So too if you have an extreme fear of heights. The overlooks can be somewhat frightening. Otherwise, this one is short and easy for the whole family. It’s a great seasonal hike too. If I make it in winter this year, I will come back here to share my experiences and hopefully post some pictures of the white stuff. Y’know, all those crazies getting in the traffic jam at Graveyard Fields can have it. I’ll take my favorite little hike all by myself. Update May 3, 2016: Spring comes to the high country too. It’s later than down in the valleys, but this visit treated me to the earliest of the wildflowers and the first greening of the new season. It’s neat too, peering into the much greener lowlands. The weather was ideal, in the sixties all day with a nice breeze. Once the typical morning fog lifted, all the cloud cover was above the endless ridges that stretch far, far away. Here are some new photos for your enjoyment, including a really out of place peony that was growing on a hillside.